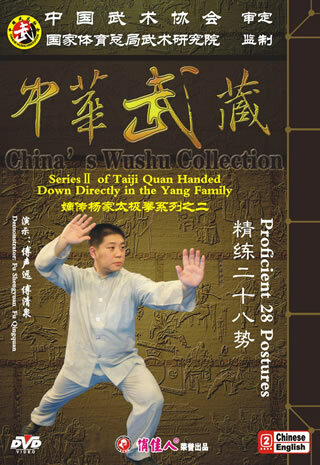 Yang-style Taiji Quan 28 Postures of Quintessence, it is created by the famous master Fu Sheng-yuan who combines his sixty years' experiences of practicing of Taijiquan. it is refined on the basis of the traditional 85 postures of Yang-style Taiji Quan thus it is arranged and created; although the boxing shortens to 28 postures but its main point the theory, the techniques, the works and the method of practicing are the same with the traditional 85 Postures of Yang-style Taijiquan's, there are no changes. This set routine of 28 Postures is built, it is gentle and smooth, the movements are changed rationally, it not only keeps the original characteristics of traditional Yang-style Taijiquan, and it accords with Wushu's rules for competition. It is suitable for the performance match, it also benefits beginner's exercise too, at present it is the model routine for the beginners who study the Yang-style Taijiquan.